Mackerel is one of the best known food fishes, and is caught in North Atlantic waters. Its skin is lustrous dark blue above, with wavy blackish lines, and silvery below. It sometimes attains a length of eighteen inches, but is usually less. Mackerel weigh from three fourths of a pound to two pounds, and are sold by the piece. They are in season from May 1st to September 1st. Mackerel, when first in market, contain less fat than later in the season, therefore are easier of digestion. The supply of mackerel varies greatly from year to year, and some years is very small. With boiled fresh mackerel, gooseberries, stewed. Lemon makes a very grateful addition to nearly all the insipid members of the fish tribe. Slices of lemon cut into very small dice, stirred into drawn butter and allowed to come to a boiling point, is a very fine accompaniment. 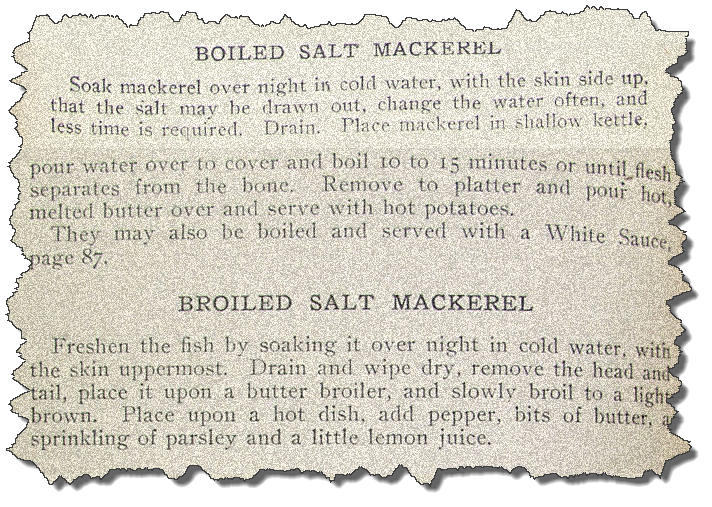 Soak mackerel over night in cold water, with the skin side up, that the salt may be drawn out. Change the water often, and less time is required. Drain. Place mackerel in shallow kettle, pour water over to cover and boil 10 to 15 minutes or until flesh separates from the bone. Remove to platter and pour hot, melted butter over and serve with hot potatoes. They may also be boiled and served with a White Sauce. Freshen the fish by soaking it over night in cold water, with the skin uppermost. Drain and wipe dry, remove the head and tail, place it upon a butter broiler, and slowly broil to a light brown. Place upon a hot dish, add pepper, bits of butter and a sprinkling of parsley and a little lemon juice. Split fish, clean and remove head and tail. Put in buttered dripping pan, sprinkle with salt and pepper, and dot over with butter (allowing one tablespoon to a medium-sized fish), and pour over two-thirds cup milk. Bake twenty-five minutes in hot oven. Mackerel should not be eaten by those with weak digestion.